With Limoncello you too can sing, "Good, good, good, good Libations.....!" "I knew it was the last seven Limoncellos that was going to get me." This statement from Danny Devito who fell victim to Limoncello over indulgence just before his appearance on the View. If you are already starting to sing about the joys of Limoncello, it's far too late and you just may end-up saying and doing things you never imagined were possible. Yes this was a few years back, but it's a funny story worth repeating, On the morning of Nov. 29, 2006, Danny DeVito showed up "sloppy-drunk" on ABC's "The View" [utterly terrible] after a long night out with George Clooney and sipping on Limoncello. But hey not all is loss, because sometimes when you are served lemons you just make lemonade or in this case Limoncello. Proving that not all celebrity PR melt-downs have to end in with embarrassment and/or collapsed endorsement deals [hello Tiger Woods]. Mr. Devito is either a smart-guy [doubt that] or he got great advice from his PR firm [which I suspect]. 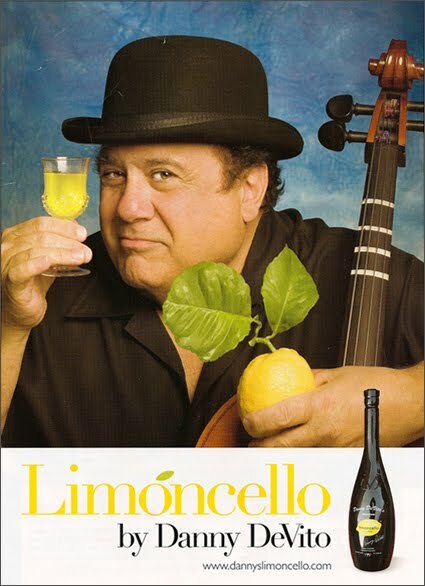 The strategy, instead of wallowing in the shame and hiding from the reporters waiting to ask the gotcha questions, Mr. DeVito launched Danny DeVito's Premium Limoncello [ala Newmans Own], which is produced and bottled on an estate of lemon trees on Italy's Sorrento peninsula. In my estimation this seems like a smart way to deal with public embarrassment, don't hide from it, wallow in it a bit, let folks see you're human and make the best of a bad situation, cheers Mr.Devito! Ahhh the joys of Limoncello, I remember introducing a friend of mine to this wondrous libation. We were in Vegas celebrating the forthcoming wedding of his sister Mindy with all the friends and family were gathered in this wonderful restaurant [private room] at the "Paris", Las Vegas. Since dinner was over I recommended that we should having some Limoncello as an after dinner digestivo. Everyone there looked at me like I like I had horns coming out of my head or somethings, but they brought everyone some served in small ceramic glasses and chilled. Unfortunately for Joe, we also had some Grappa (this is another story) shots just before dinner, some great vino and with the mixed results, he laid waste to a one arm bandit in the lobby, it was quite a "splatacular" scene. Adding insult to injury and little embarrassment, security was called with a wheel chair to help him out to a taxi and back to his hotel. It makes me wonder what I may be sitting on in those cabs, not a great image. Personally I like to have a nice one ounce pour just before dinner, it seems to cleanse to the palate and enhance my gastronomical experiences. Limoncello, is a wonderous libation. I keep one cooling its heels in my freezer. (just be careful to not lay it on its sides, you'll get drippage) The tradition in Italy is as an after dinner digetivo, which I think is a good practice. Part of the "Mediterranean lifestyle" as it is said. Just a few ounces in a stemless Reidel Chardonnay glass. Not sure why I use that glass, for lack of an more appropriate glass. I find the ones imported from Italy are the best. The color as you can see, is bright yellow, sweet and lemony, but not sour since it contains no lemon juice. I understand it is also easy to make at home, although I've not tried out the recipe myself. It is pretty inexpensive to purchase. I think this a perfect summer after-dinner drink, in place of the normal sherry, port, and madeira which in my estimation are better suited for the fall and winter months. So if you have never tried Limoncello to this point, seek some out, throw it in the freezer, wait ,pour and enjoy. Just a warning it can sneak up on you, just ask Danny. Please let me know what you think, I look forward to hearing about your adventures with this amazing libation. If you want to make it at home, it's a fairly easy recipe. I've included this video below, so you can attempt to make some for yourself!